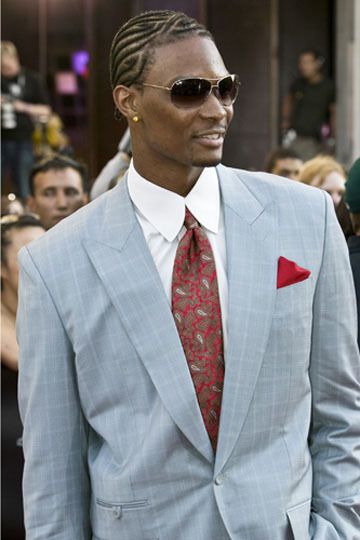 Early this week Chris Bosh stated that he is excited about moving in 2010. Chris affirmed that he will not resign or renegotiation any contracts presented this summer with the Toronto Rapters. Bosh is the 1st big superstar to commit himself publicly to the 2010 free agency fiasco.Currently Lebron James dances around the topic, while Dwayne Wade refuses to say anything at all. Chris Bosh maybe the only one of these stars to have any real intelligence. Everyone knows that this is a business, so you should never worry about team chemistry or what the team thinks! You need to just make sure you get what you deserve. Bosh is doing that exactly. Bosh has all the leverage and he knows it. If he says he won’t resign then Toronto will have to throw him expontetional more money to even try to resign him. The only “no no” in this situation would be for him to bash the fans of Toronto openly, which to my knowledge he has not done. King James and D’Wade maybe have something to learn from Chris Bosh, because in 2010 he is going to get his! Tagged: 2010 NBA offseason, Chris Bosh 2010 Free agency, Chris Bosh free agent, Chris Bosh Hates, Chris Bosh refuses, Chris Bosh rules, Free Agent list for 2010, NBA free agency signings, NBA Free agents of 2010, Who will sign Chris Bosh?, Will Chris Bosh resign?